CONGRATS (USA) (2000). 7 wins-1 at 2, Santa Anita San Pasqual H., Gr.2. Sire of 948 rnrs, 634 wnrs, 31 SW, inc. Turbulent Descent (Hollywood Starlet S., Gr.1), Haveyougoneaway, etc. Sire of the dams of SW Hartley, Steps, Derek Adrian, SP Mojovation, Mi Vaquita, Pete Marwick, Poseidon Aquarius and of With What, Crown and Sugar, Eclair Beauty, Royal Road, Saints' Girl, Sunset Empire, Vincero, Backdoor Route, Bullbear Boar, Comebackmoment, etc. Slow Hands (g. by Reliable Man). Winner at 1200m in 2017-18, 2d Waikato RC Design Depot H.
Majulah (g. by Postponed). Winner at 1400m in 2017, 2d Singapore TC Class 4 H.
Brown Burberry (g. by Big Brown). Winner at 1600m in Aust. UNITE AND CONQUER (Hinchinbrook). 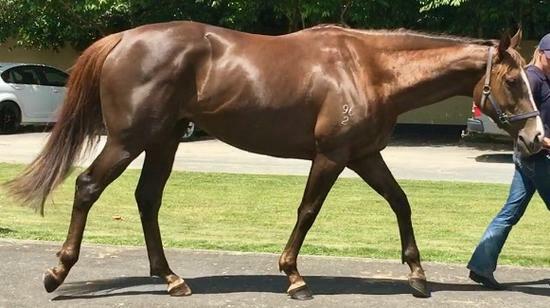 Winner at 2, A$80,200, in 2018-19, VRC Maribyrnong Trial S., L.
Danglissa Girl. 2 wins-1 at 2-at 1200m, BRC Hosken Site Steel 2YO P., 2d BRC Haymans 2YO P., SCTC Workplace Central 2YO P., 3d BRC Gary Palmer Memorial 2YO H.
Magnascope - Luke Man (Mal.). Winner at 1200m in 2018 in Malaysia, 3d WATC Belmont Bonanza P.
Tolstoy. 9 wins to 1200m to 2018-19 in Aust. Ready and Able. Winner. See above. Platinum Red. 2 wins at 1400m, 1600m, 2d AJC Randwick Betting Auditorium 2YO H., Clovelly H., ATC Bowermans Office Furniture H., Liverpool Chamber of Commerce H., Patinack Farm H., 3d ATC State of Origin Live at Rosehill Gardens H., STC Members 2YO H.
Hakerak. 2 wins at 1400m, 1500m to 2017-18 in Aust. EURYALE (Lonhro). 5 wins-2 at 2-from 1200m to 1900m, A$382,363, VRC Gibson Carmichael S., L, ATC McCain Advantage Significant S., MRC New Litho 2YO H., ATC Zac Homes H., Gaypak & United Fruit H., 2d VRC Secondbite 2YO P., ATC Nova 969 Fitzy & Wippa H., 3d VRC Fashion S., L, MRC Breathless H., ATC Tab.com.au H., St Johns Park Bowling Club H., MRC Frank O'Brien H., 4th ATC Premier's Cup, L.
Athena Lass (Snitzel). 2 wins-1 at 2-at 1000m, 1100m, A$93,250, to 2016-17, MVRC William Hill 2YO H., 2d MVRC Adapt Australia H., 3d MRC Quezette S., Gr.3, MVRC Roll the Dice Racing H., 4th MVRC Atlantic Jewel S., L.
Striking Achiever. 4 wins at 1050m, 1200m to 2017-18 in NZ and Macau. SWEET REDEMPTION (Snitzel). 6 wins-1 at 2-from 1200m to 1600m, A$401,810, to 2017-18, ATC Festival S., Gr.3, Toy Show H., Gr.3, TAB Rewards 2YO H., TAB Rewards H., McGrath Estate Agents Qld H., 2d MRC Summoned S., Gr.3, TTC Tasmanian Oaks, L, Goulburn City Cup, ATC TAB Place Multi 2YO H., Legea Xmas Party H., 3d MVRC Alexandra S., Gr.3, BRC Brisbane H., L, ATC Cafe Culture Insitu H.
DANGLISSA (Danzero). 6 wins. See above. Casting. Winner at 1200m, BRC Membership With the BRC S.
Sneakerella. Winner at 1250m, STC South Juniors H. Producer.